The Potala Palace seen from the Jokhang Temple. 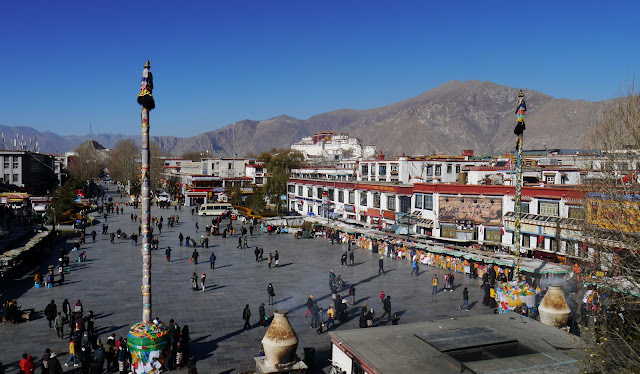 View from the roof of Jokhang Temple. Lhasa, with the Sera Monastery at the foot of the mountains and a hermitage (yellow building) seen half way up. Wooden printing blocks in the printing house of the Sera Monastery. 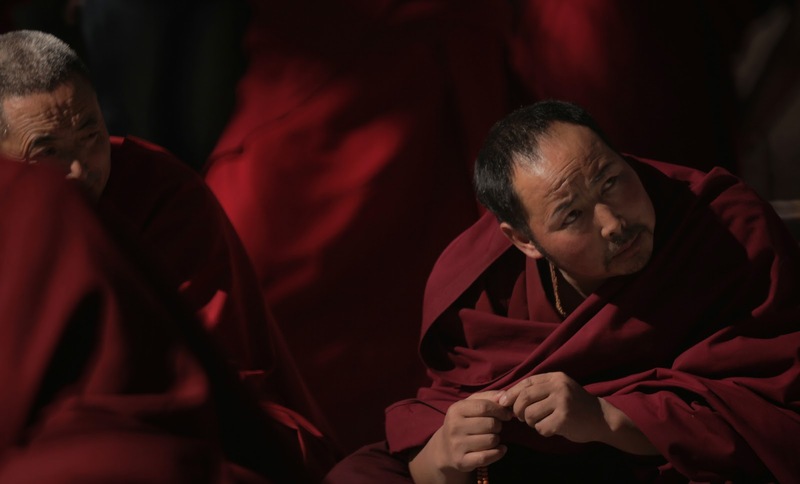 Student monks debate the philosophies of Buddhism. 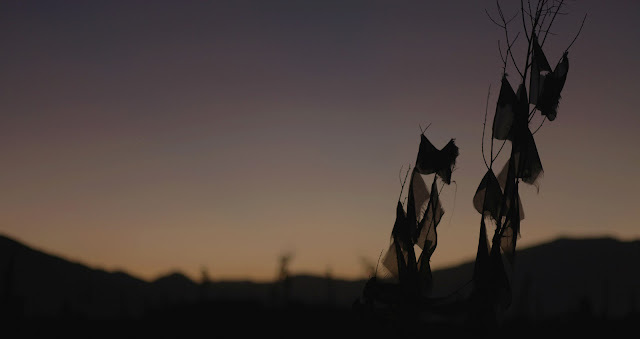 Prayer flags after the sunset. Hits of oxygen about 3 dollars at our hotel. We fortunately were fine with the altitude change. One of the many 'auspicious' peaks of the mountains that surround Lhasa (note the prayer flags). The Potala Palace dominates the skyline at night. 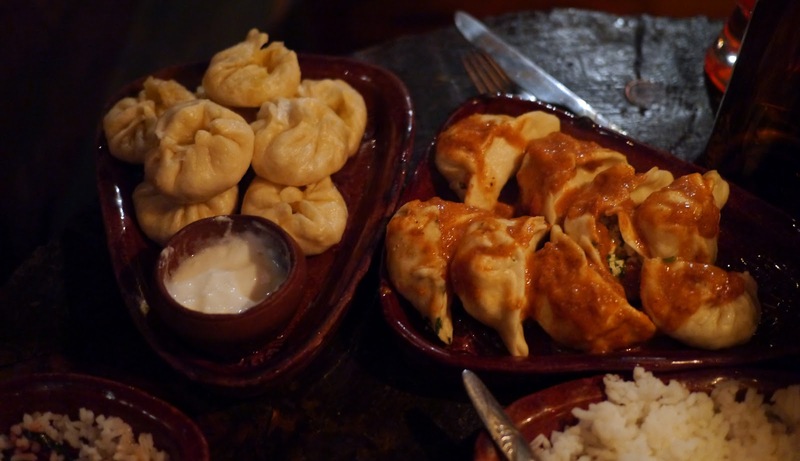 We really are having a wonderful time in Lhasa. Our Tibetan guide and Tibetan tour organizer have made the experience really valuable. Our first full day we visited the Jokhang temple in the morning. The devotion of the pilgrims prostrating themselves outside the temple (some of whom have made the 30 day trip from their village in this fashion) is moving. The temple was built 1300 years ago by the popular King Songsten Gampo. Originally it was built to house an image of Buddha brought to Tibet by the king's Nepalese wife, but it is actually the Jowa Sakyamuni (sacred statue of Buddha brought by the Chinese wife) that makes this temple the spiritual heart of Tibet. In the afternoon we went to the Sera monastery, where pilgrims stand in line for hours to be blessed with health and longevity. 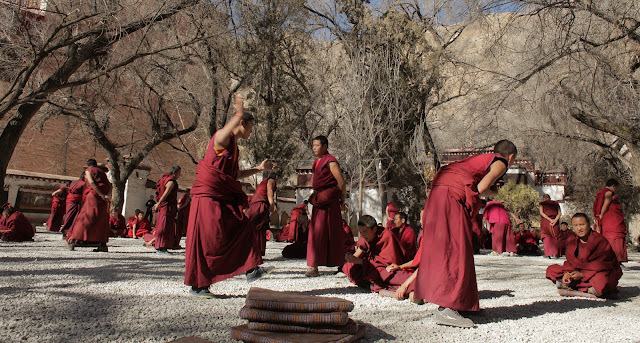 Also, the young monks here spend their afternoons in active and lively debate about logic and philosophy (with lots of claps and stomps, I think to emphasize their points). Today we visited Potala palace, which is a marvel in any century. Most notably it is the former residence of the Dalai Lama(s). 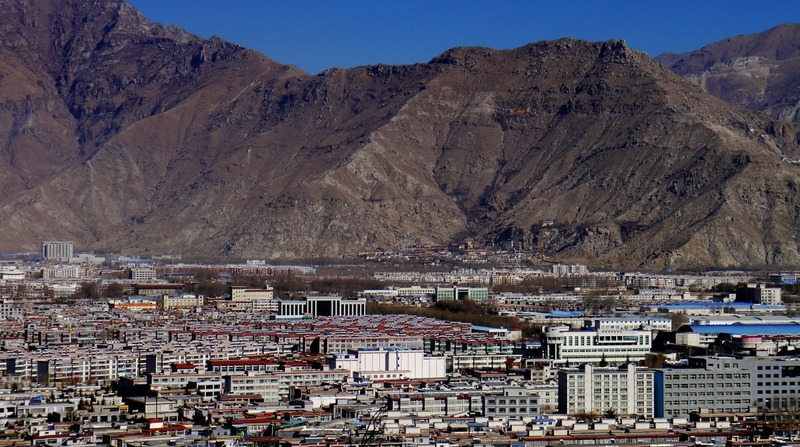 It was also both the spiritual and governmental center of Tibet. Deep within the palace there are two chapels that remain from the original 7th century structure. The rest of the palace was built between the 17th and 20th century. It contains a thousand rooms, over 200,000 statues, and the tombs of 8 former Dalai Lamas (5, 7-13). There are a series of tunnels built throughout the palace in case the need arose to make a hasty exit. And there were, at one time, rumored to be hidden rooms that contained enough wealth to built the palace again. Later we wandered through the Tibetan and Muslim parts of town. People have been so much friendlier than we are used to, and are quick to smile back at us and thank us for using our poorly pronounced Tibetan greetings. It is low season, and it was particularly hard to get permits to visit the past few months, so other than a handful of Chinese tourists, and the pilgrims, we're it. We haven't seen any other foreigners, and we are the only guests in our hotel.